The incorporation of heteroatoms into large aromatic chromophores can afford novel chromophores for organic electronic applications. The synthesis of heteroacene chromophores can pose a variety of challenges including issues related to regiochemical control of the heteroatom(s) incorporated. For example, materials based on the anthradithiophene chromophore (ADT, 1) have traditionally been synthesized as a mixture of inseparable syn- and anti-isomers (1a and 1b, respectively, Figure 1). It was unclear whether improved charge-transport could be achieved if isomerically pure materials were used instead of mixtures of syn- and anti-isomers. To answer this question, commonly referred to “the isomer problem of anthradithiophenes”, the synthesis of isomerically pure ADTs was developed and organic field effect transistors (OFETs) based on single crystals were characterized. Figure 1. Structure of syn- and anti-anthradithiophene (ADT) and related functionalized derivatives along with their device characteristics for single crystal OFETs (ID = drain current, VGS = gate-to-source volatage). The slope plots of the square root of ID (black) was used to estimate the charge-carrier mobility (μ as high as 1.0 cm2/V•s). The performance of single-crystal OFETs based on isomerically pure syn-ADTs was compared to those based on mixtures of syn- and anti-ADT isomers and their performance was determined to be comparable. This was attributed to the positional disorder in the solid-state packing that is observed both mixtures and in isomerically pure samples of ADTs (Figure 2). Figure 2. X-ray crystallographic structure of syn-ADT 2a illustrating the positional disorder of the thiophene moieties in the solid-state. To address the issue of positional disorder observed in the solid-state of materials based on the ADT chromophore, the thiophene moieties were formally benzannulated to provide a new chromophore, namely anthrabisbenzodithiophene (ABBT), which features a slightly bent structure relative to the linear ADT oligoacene. It was thus expected that disordered solid-state packing observed for ADTs should be avoided with ABBTs via more discriminate interactions in the solid-state, based on both steric and electronic demands provided by this benzannulation strategy. X-ray analysis of these molecules did indeed support our hypothesis and allow for the achievement of ordered solid-state arrangements. Initial OFET devices based on thin films of isomerically pure syn-ABBTs displayed charge-carrier mobilities of 0.013 cm2/V•s, further optimization of the solid-state packing of this chromophore should allow for performance improvements. Figure 3. Structure of syn- and anti-anthrabisbenzothiophenes (ABBTs) and the solid-state packing of syn-ABBT 4a illustrating the absence of positional disorder due to the bent nature of the ABBT chromophore. These ADT and ABBT derivatives are highly crystalline and exhibit strong crystallochromism (changes in color due to different solid-state packing of the chromophore). The photograph below illustrates this crystallochromic effect of the samples ranging from bright organge to pink, red, dark purple and blue depending on the nature of the substituents (R1 and R2) which are responsible for the changes in the solid-state packing of the chromophore. Figure 4. (Top) Photograph of various functionalized heteroacene samples illustrating their crystallochromic effect. (Bottom) Photograph of various solution- and solid-state samples under irradiation with 366 nm wavelength light. The incorporation of nitrogen atoms into large aromatic chromophores can afford novel chromophores for organic electronic applications. As part of exploring benzannulation chemistry of acetylenes to synthesize halogenated naphthalenes building blocks, we demonstrated a new synthetic approach to rapidly access diazatetracenes. The incorporation of the basic nitrogen atoms enables for stimuli response behavior as a result of changing the HOMO—LUMO energies depending on the protonation state of the chromophore. Both optical and electrochemical response can be used to detect protons and depending on the concentration of protons in solution, red-shifted optical spectra and >1 volt electropositive shift in redox potentials can be observed. Figure 2. (A) UV−vis absorption of diazatetracenes 1 and 2 in CH2Cl2 without (solid lines) and with TFA (dashed lines) present. Note: The data for 3 are qualitatively similar to that those of 2 and omitted for clarity (see the Supporting Information). (C) Photograph of diazatetracenes 1 (orange solid) and 2 (red solid) in the solid state. 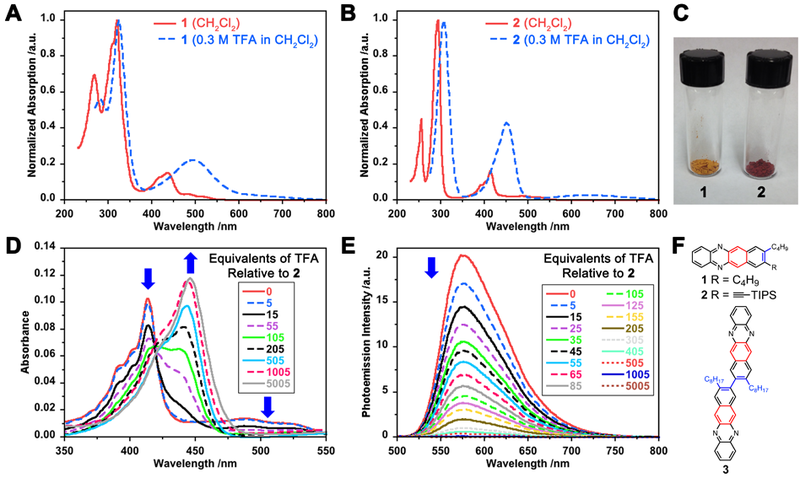 (D) UV−vis absorption and (E) emission spectra (λexc = 414 nm) of 2 in CH2Cl2 in the presence of varying amounts of TFA. (F) Chemical structure of diazatetracenes 1—3.